Should medical students and doctors have a say on climate change? Earlier this year the Royal Australasian College of Physicians (RACP) controversially thrust Australian doctors into the climate change debate via a high profile media release commenting on the government’s proposed carbon tax. The release supported action on climate change, but urged the government to ensure that proposed measures did not impact negatively on the health of socioeconomically disadvantaged populations by driving up the cost of living. Headlines such as ‘Doctors fear health impact of carbon tax’ greeted this announcement and stoked the political conflagration surrounding the proposed tax. In the fallout the chairman of the RACP’s climate change working group resigned in protest at the wording of the statement which was at odds with the recommendations of the working group. A revised statement was released several weeks later softening the wording of the initial release. Outside observers within the medical profession have suggested that this may have significantly dented the credibility of the college. Internationally, climate change has been framed by prestigious medical journals such as the BMJ and the Lancet as the ‘biggest global health threat of the 21st century’. A series of papers in these journals have been at the forefront of the drive for involvement of medical professionals in this debate. Medical colleges and public health groups in Europe and America have begun to weigh in on the debate, however aside from the RACP Australian medical colleges and associations have been relatively quiet on the subject. In contrast, the Australian Medical Student’s Assocation (AMSA) has launched ‘Code Green’, an education and advocacy campaign to encourage medical student participation in the debate. Various universities, most notably Monash University have initiated similar education and advocacy campaigns. The potential public health impacts of climate change would by definition draw medical professionals into certain aspects of policy and management, however in such a politically loaded and emotive issue is it wise for medical groups to step further into the debate than the health aspects? How do you define the ‘health aspects’ of such a debate? What should the role of Australian medical professionals and students be in this debate? Should AMSJ take an interest? Have your say below! While this is not the forum to debate the science of climate change, insightful comments or responses to the above questions are welcome. 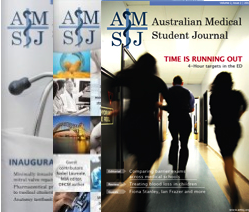 If you feel particularly strongly about the issue, why not submit an article or letter to the next edition of AMSJ?